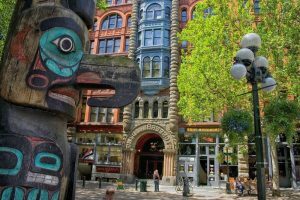 Event Description: Seattle’s oldest neighborhood, Pioneer Square is is a great place for a corporate teambuilding event — a spot where you can feel the whispers of the city’s rich, historic past. Turn-of-the-century street lamps line the square. Cobblestone streets abound. Stately red-brick Victorian Romanesque buildings lend warmth and a certain grandeur to the area. And underneath, the famed Underground Tour displays eerie sunken storefronts from the 1880s. Today, Pioneer Square is the home to art galleries, eateries, antique shops, cool restaurants and a buzzing nightlife, especially when the Seahawks are in town. But it’s the echoes of the past, seemingly at your fingertips, that really bring Pioneer Square alive. During your corporate teambuilding treasure hunt… expect to encounter a classic train station; a towering totem pole; a monument to fire fighters; the home of Seattle’s first auction house, and a whole bunch more. Gather outside Doc Maynard’s on First Ave.